Adventure sailing in the Whitsundays is the ultimate experience. Join an adventure sailing tour on a maxi yacht and you are bound to have the time of your life that is full of real sailing, fun people and amazing destinations! Maxi sailing tours, the best type of tour for adventure sailing, are great value for money and are one of the most fun ways to experience sailing in the Whitsundays. Cheap, affordable, budget-friendly - whatever it is you're looking for, a maxi is it! They provide a quality experience on the water and are designed for backpackers and those looking for a bit of extra fun. They are a social scene on the water, full of late nights and early mornings and packed full of adventure and excitement. There are so many reasons to choose an adventure sailing tour on a maxi yacht! They are a Whitsundays icon and provide an unmatched experience that has been enjoyed by many people over the years. Below we've listed the top 11 reasons why you should go on a maxi yacht! Maxi yachts are the best place to enjoy performance sailing in the Whitsundays. Maxis pride themselves on hoisting their sails and reaching top speeds as they cut their way through the water, allowing you to feel the thrill of sailing! If you have never been sailing, then this is the place to start. There's no better feeling than feeling the power of the wind as you head to some of the most beautiful and iconic places in the Whitsundays. Maxis are known as some of the most fun tours for backpackers in the Whitsundays! Guests on board are aged 18-35 years old and make for an amazing travel group full of energy and fun! If you're backpacking then an adventure sailing tour is the ideal place to spend a few days on the water. Maxis always have an awesome crew. Fun and full of energy themselves, they will host you during your tour and show you the best time possible! Their infectious personalities will encourage even the most reluctant traveller to want to get involved and experience something new! They will make sure you feel involved and ensure you're making memories and having the time of your life. They are great at their jobs and are genuinely part of the overall experience. Performance sailing yachts can get up to top speeds when they have their sails up during a good breeze. When you spend less time cruising around, you get to spend more time exploring the Whitsundays' top destinations! The fast speeds add to the experience as you get to feel the power and pull of the wind. Your maxi sailing tour is sure to be a social one. Whitsundays Maxis in the take between 23 and 29 guests, all of which are aged 18-35 years old and are usually a pretty social bunch. You will spend your days and nights alongside the other guests, getting to know them as you enjoy the adventure of a lifetime. You may walk on board as strangers, but you will walk away as friends. One of the biggest perks of a social trip like a maxi tour is the people you meet along the way. Maxi yacht tours are a great budget sailing option. But affordable doesn't mean they are cheap (not in terms of quality anyway)! You will still get good accommodation and freshly made meals, as well as a top-notch crew and vessel. Maxi yachts are a great sailing option between the lowest budget boats and the more expensive overnight tours that will still allow you to do it all with the added perk of authentic sailing. 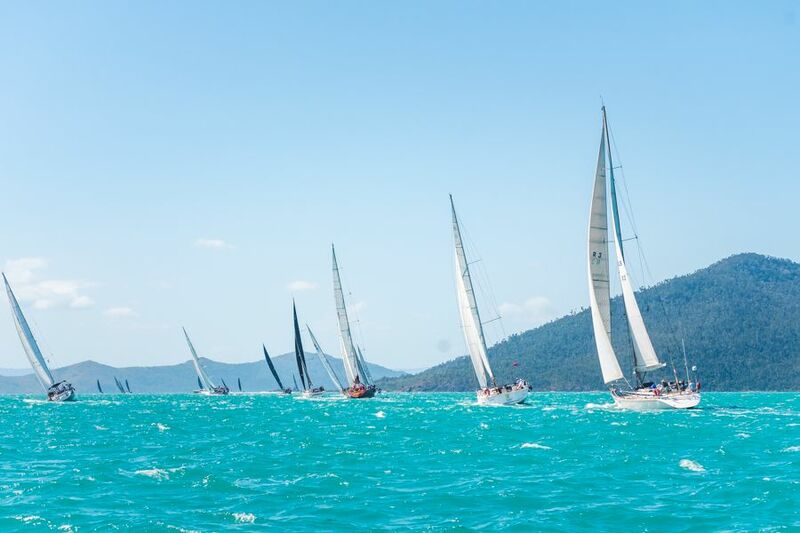 Experience racing in the Whitsundays! Don't be surprised if you find yourself in the middle of a race while on a maxi! They are after all, all ex-racing boats! If you happen to cross another performance sailing boat during your tour, your crew might be tempted tack up and go for a little competition and race for bragging rights! This is a fun perk to any sailing tour, where you will get to really see the crew in their element, coaxing the boat to reach top speeds! Maxi yachts are all BYO - that is, you bring your own alcohol on board with you. This is a great way to cut costs during your travels without the large markup of a licensed bar. Your crew will store your alcohol on ice or in a fridge to ensure its always icy cold for when you want it! If you're really looking to curb your budget, pick up some goon at the local bottle shop. All the maxis in the Whitsundays will visit the 'big three': Whitehaven Beach, Hill Inlet Lookout and the fringing reefs of the Whitsundays. The longer the tour, the more time you will get to spend at any destination. Often times you will get more than one chance to snorkel and check out the colourful coral reefs and spend several hours at Whitehaven Beach and Hill Inlet Lookout. A maxi yacht is at least 70ft (21m) in length, providing plenty of deck space for guests! Many boats in the Whitsundays are smaller than this, giving you less space to roam below or above deck. The extra deck space provides plenty of room to lounge around while you're on board, providing extra comfort. Our favourite place to sit is with your feet dangling over the side of the deck as the boat leans with the wind! All the maxis in the Whitsundays have a history of racing. So when you hop on board one of the adventure sailing maxis, you are delving into a little piece of maritime history! Each and every boat has a unique history that stretches to all corners of the globe, adding extra colour to their personalities. Your crew will tell you all about your boat's accomplishments and where they've been around the world as well as what races they've won. There are several adventure sailing maxi yachts in the Whitsundays. They are suited for backpackers and solo travellers offering budget friendly, fun sailing options. Each tour departs on different days of the week at different times, ensuring a tour for everyone, no matter what time you arrive or what dates you are travelling. Each tour has similar itineraries and diverse histories that will show you the best time in the Whitsundays. Hammer: 2 day, 1 night. 23 guests. Hammer is a party on the water! 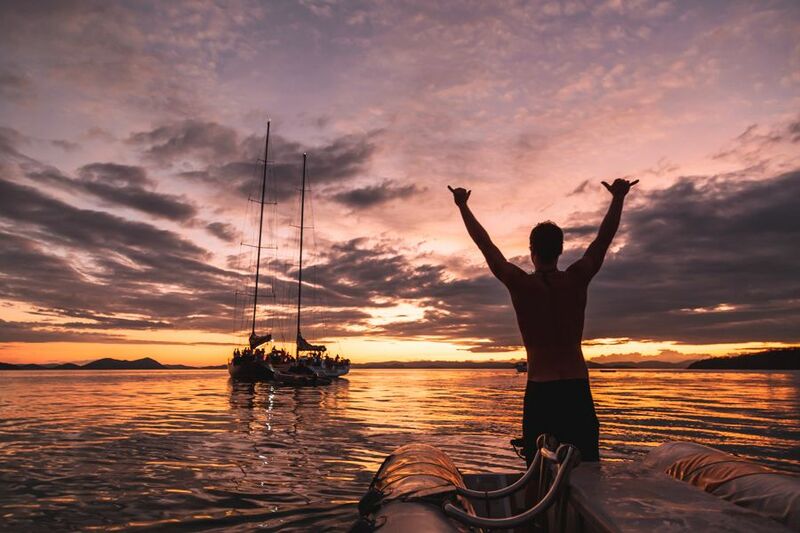 This fun 2 day tour is all about sailing and fun as you make your way around the Whitsundays making this performance sailing yacht is the backpacker trip of a lifetime. 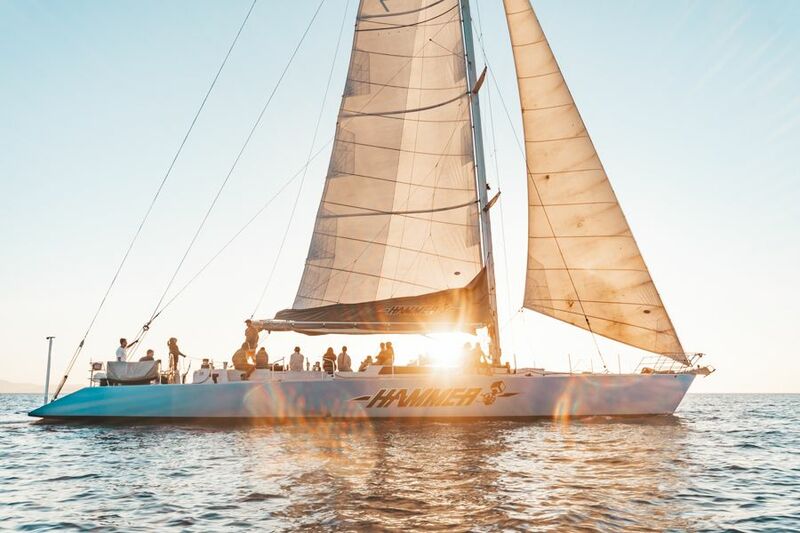 Hang out with guests on board, explore all day, enjoy a few drinks at night - Hammer is one of the best sailing trips in the Whitsundays for those who crave fun and adventure! Siska: 2 days, 1 night. 24 guests. Siska is another of the fun party maxi yachts in the Whitsundays that promises the adventure sailing trip of a lifetime! This tour is great for backpackers who are looking for an affordable option that involves plenty of sailing, lots of adventure and an excess of excitement! Siska has a bright red hull that makes her hard to miss as she cuts through the water and waves around the Whitsunday Islands. Broomstick: 2 days, 2 nights. 25 guests. Broomstick will fulfil your need for speed! This fun 2 night tour will give you plenty of time on the water where you can really get a feel for adventure sailing! She has competed in many competitions all over the world and has made a name for herself in the racing community. Since coming to the Whitsundays, Broomstick has been a great place for making memories and enjoying the thrill of sailing! Condor: 2 days, 2 nights. 29 guests. Let the ocean breeze take over as you cruise around on Condor. She is a spacious maxi yacht with plenty of room on board to hang out, party and enjoy the island life! Condor's crew will show you the best 2 days and 2 nights of your life as you make your way around from place to place under the power of the wind. Boomerang: 2 days, 2 nights. 28 guests. Boomerang's sailing history makes her a racing icon and the perfect place to spend a couple of days in the Whitsundays. Enjoy hands-on sailing or just relaxing on deck - this fun, social tour is great for backpackers, solo travellers and the young at heart to enjoy the Whitsundays they want! Get ready for 2 days of adventure with this Aussie icon. British Defender: 2 days, 2 nights. 28 guests. British Defender is the only maxi yacht in the Whitsundays with air-conditioning, making her especially sought after in the summer months. And just like other maxi yachts, British Defender has extra deck space that's great for relaxing and hanging out during the day or night, where you can socialise with the other travellers on board! Maxi sailing is great any time of year. The Whitsundays themselves are great any time of year! All you need to enjoy an adventure sailing tour is good people, a good crew, and of course, a good boat! A little wind and a little sun won't hurt either, but each and every tour is going to be fun no matter what. Tours are conducted the same all year long, with the exception of stinger suits in summer and possible whale sightings in the winter season. Don't forget - seasons are opposite in the southern hemisphere than in the northern hemisphere, so depending on where you're coming from, you may be coming into an unexpected season! December-February: Summers in Australia tend to attract a larger crowd of travellers, and are generally the busiest time of year. Days and nights are typically pretty warm, coinciding with the wet season. March-May: Autumn will see temperatures cooling a bit, dropping lower as you get close to winter. June-August: Winters bring with them the whale season, which is a huge perk to coming in the cooler months! They are usually fewer tourists around then too, giving you a better chance of getting on the tour of your choice. September-November: Spring will see temperatures start to rise again, as well as the humidity levels - both getting higher as you get closer to summer. This is the easy part! Once you decide which tour you want to go on and when all you need to do is either ask us about it in the chat box or request to check availability on the product page. We will check to see if the boat you want is available for your dates of travel and get you on your way to exploring the Whitsundays. We will make sure you get on the boat that is right for you! Maxis are the quintessential way to explore the Whitsundays. 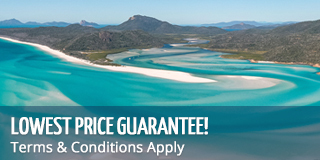 It checks off all the top bucket list items: sailing, snorkelling, Whitehaven Beach and Hill Inlet Lookout all while still being affordable and within reach! They are fun without being too expensive, and spend the perfect amount of time on the water, making these tours suitable for backpackers, solo travellers, and adventurists who want to spend time on a race boat. Choose from 1 or 2 nights and get all that you could want and more on board a Whitsunday maxi yacht. To browse some of our favourite options, click here.